Maria V. Snyder is an author that I hadn't experienced before now - despite her sitting on the very top of my 'must-read author list'. Needless to say, I was very excited to get my hands on an advanced copy of Storm Watcher; even though the lack of any kind of fantasy or sci-fi elements usually turns me off quicker than anything. And coming from a HUGE feline-lover, the aspect of dogs and dog training didn't especially appeal to me at first. That being said, Storm Watcher ended up being an easy, engaging and enjoyable read! 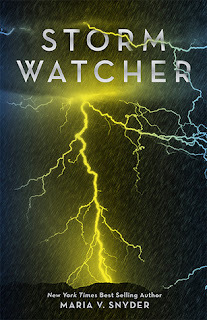 Storm Watcher is a short story, one that could easily be read in one single sitting. As can be expected, with a limited number of pages comes less time to develop characters (and their relationships as well as any complicated plot points. I was pleasantly surprised that Snyder managed to still make me care about Luke, his family, friends and even the freaking dogs! I was amused, and at times even a little heart-broken. As an MC, Luke was very relatable. He's suffered a loss but he's dealing as best he can. His voice was quite believable and I enjoyed seeing his world from his perspective. He's innocent, yet at the same time focused and hard-working...not to mention his love of dogs is kind of contagious. I especially like his fascination/fear with the weather since I happen to think weather is pretty darn interesting. There isn't much else I can say, while it was an enjoyable read I can't say I developed any especially strong attachment to the story as a whole but I still feel like it was worth the read. In fact, the family dynamics were quite memorable. If anything, reading Storm Watcher made me all the more curious about Snyder's fantasy series, which I feel are more up my alley anyways. I'd recommend this one to children's/middle-grade readers, animal lovers anyone with an even passing interest in meteorology! This one isn't your usual type of read at all, it's true! Well, I'm glad you liked it overall even still. This is the first time I've heard of it actually... it sounds unlike any other books Maria V. Snyder has written, so I'm surprised. I'm actually still a MVS virgin despite her being on the top of my must-read author list, too! From the sounds of other reviews I've read, I'm pretty sure both of us would be crazy about Poison Study so that one tops the books of hers that I want to read first. This one has an interesting concept too though! And as a dog person rather than a cat person, I'm sure I would be all over that! I think I would probably share your feelings about not being able to become attached to the story though. I often find that that's the case with shorter novels... I need them to be an adequate length to fully get into them, which is why I usually avoid short stories and novellas. I think I'll still add this one to my tbr for maybe later, but I'll prioritize MVS's other novels first! Thanks for this review, Micheline - very helpful! !